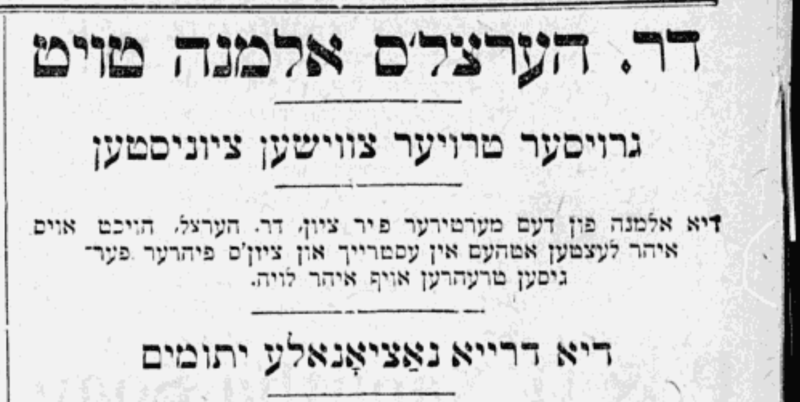 Yidishes tageblat, November 24, 1907: DR. HERZL’S WIDOW DEAD. GREAT TRAGEDY FOR ZIONISTS. The widow of the martyr for Zion, Dr. Herzl, drew her last breath in Austria, and Zionist leaders shed many tears at her funeral. The opera I am writing with Librettist Ben Kaplan, The State of the Jews, features this take on Julie. We depict her as critical and complex, in the most vivid and sympathetic rendering we can muster. Her’s is a hidden and largely forgotten voice that we feel deserves to be heard alongside Theodor’s. Excerpts from Theodor Herzl’s letters translated by Sarah Glover. Jennifer Goode Cooper sings the role of Julie in an American Opera Projects workshop performance. In the aria, Julie laments the disparities between her own and Theodor’s visions for their shared life. Theodor is played by Mario Diaz-Moresco, piano is played by Kelly Horsted, stage direction by Mary Birnbaum.